Looking for H.I.D. bulbs but not willing to mortgage the house to get them? Well, these SilverStar 9003 bulbs deliver the intensity of H.I.D. systems but are priced for all us average Joes. Yes, brighter light is as easy as upgrading to these SilverStar bulbs. These Sylvania Silverstar 9003 bulbs deliver the whitest, brightest and sharpest halogen light that outperforms the competition, hands down. 9003 SilverStar bulbs deliver a white hot 4000k (Kelvin) which is far higher than other halogen bulbs on the market today. In fact a Kelvin rating this high is comparable to High Intensity Discharge (H.I.D.) systems found on many high end luxury vehicles today, considered the brightest lighting available for automotive applications. 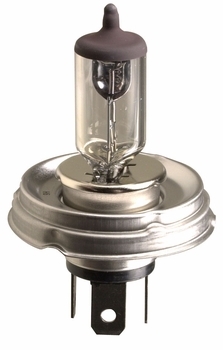 In addition, these Silverstar 9003 bulbs shine with a luminance up to 20% greater than other halogen bulbs. The amethyst blue coating, silver tip and sharp profile all conspire to create a dramatic high-end, crisp, clean look. Combine all these factors and the result is an entirely new night-time driving experience. All this means clearer visibility, safer travel and a high-end appearance. Silverstar bulbs deliver light up to 35% brighter, up to 30% more downroad visibility and up to 35% more sideroad visibility. Delivers the whitest, brightest and sharpest halogen light. Gives the look of H.I.D. systems. White hot 4000k (Kelvin) far higher than other halogen bulbs. Replaces your factory headlight capsule.